Daily Illuminator: Magic Items? Third Time's The Charm! October 1, 2012: Magic Items? Third Time's The Charm! You can never have enough magic in your life -- and that's true whether you're clearing out a dungeon, tinkering with your clockwork automaton, or flying through space. Wait . . . what? 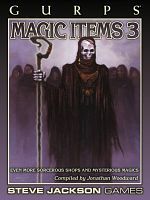 Newly uploaded to e23, GURPS Classic: Magic Items 3 includes another collection of occult-energized artifacts. However, in addition to goodies of interest to a fantasy world -- including mummy powder, bridgestones, and decoy staves -- this supplement expands its selection by offering possibilities of interest to other settings. Wield the magical revolver Prairie Mercy in a magical Old West setting. Entangle ghosts with a spirit rope in GURPS Technomancer. Power a spaceship using only your mind . . . and a magic-fueled drive core. And much more! Push the envelope of magical thinking, with GURPS Classic: Magic Items 3. Now not even the sky's the limit!